More Serious Stuff About The Queen Reef & Management/Oceans Governance.. 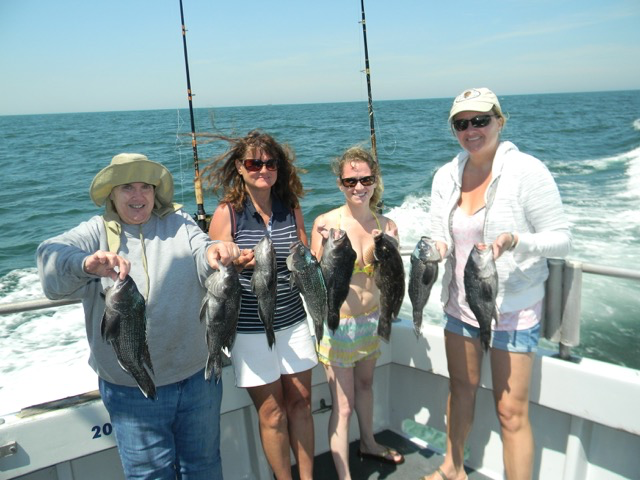 Opening Reservations For July -- These are "We'll Fish For What's Biting Trips" .. Might be flounder, might be sea bass, might be a mix. If you absolutely have to have one and not the other, don't reserve! 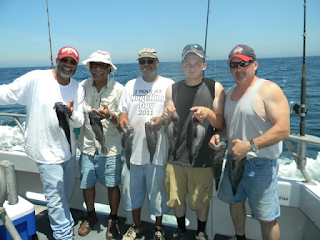 Floyd, Warren, & Wayne; plus the Bradleys were aboard for some drop & reel sea bassing. An outstandingly polite young lady, here's Tara with what would become the pool winner..
Young Andrew very proud to be out fishing with dad..
Ladies, lead by Cathy (left) put a smack-down on most of the fellows. She's been fishing with me about 35 years.. 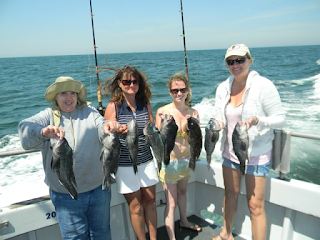 Assisting were Elizabeth, Melissa, & Kathy..
Been having fair to middling luck on the sea bass. The extremes run from some clients not even catching dinner, to a quarter of them limiting out. Seeing a few more flatbass--flatties--fluke--flounder. "Few" being the key word. Watched one skilled young man catch 5 - all throw backs. Another fellow was trying to get his Mom a flounder for dinner - done in three drops. No limits yet. Just a tease. Getting ready to happen though I think. Won't keep it a secret. Seeing loggerhead turtles, first flying fish of the summer, first greater shearwaters (sailor gulls,) soon have an inshore tuna bite, &, I hope, a fine summer flounder season. Wrote on 6/5/17 about affects to fish on our reefs from survey equipment. The African Queen Reef has been especially hard hit. So hard hit that on Father's Day Weekend Saturday, & gloriously calm, there wasn't a single boat fishing on the reef site.. It's not a simple problem. Survey equipment only worsens a situation brought about by short-sighted management. Now I find there are several projects going on -- and one of 'em, this one with the Bordelon, appears to be a secret. 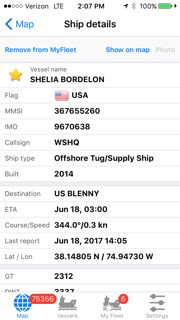 The Sheila Bordelon was back again on Sunday, 6/18/17. If no one was on the reef Saturday in a flat calm, Sunday's wind dern sure kept all private boats away. They're announced destination is the Sub Blenny, an artificial reef 1/4 mile from the African Queen. Among several boats that have shown up to "survey," none have actually visited the Blenny. They've shown no interest in it at all. Everything's been on the Queen itself. Now I hear there's an unassociated study going on at that same wreck with noise which mimics a wind turbine's piling being driven in. Includes some sea bass with acoustic tags and 'listening' stations that can hear where these tagged fish are. Glad there's some fish there..
Sure ain't many. Skilled skippers, real skilled -- goose egg. Been fishing there a lot of years. Used to be just the Queen by itself. (great article on the history of the wreck.. http://articles.baltimoresun.com/2002-07-06/features/0207060081_1_danielsen-african-queen-delaware-bay ) When a dive boat would show up after a fishing boat was already there, or vice-versa, it was a long run to another spot---a brutal waste of clients' time..
Now there are numerous types of artificial reef there -- a lot of reef. Some sunk by MD's reef program (gone by 1997 in favor of an oyster hatchery,) & some by the Ocean City Reef Foundation. Always fished there a few times a year when there was no limit of any sort on any fish. I saw great catches of sea bass, tautog, & red hake (ling.) Even saw cod, pollock, amberjack, jack crevalle, barracuda, spadefish, & triggerfish. But it was fishing -- could easily be a bad day too back then. I looked through my log books to see what happened with sea bass in those early years as self management began & then real regulation. It was here in 1992 (5 or 6 years before Federal sea bass regs began) that I realized the 9 inch size limit was going to work, and work incredibly. That first summer we were seeing sub-9 inch sea bass with even 4 hook wounds in their lip. Fishing -- the catching, was obviously improving owing not only the addition of habitat, but also our boat-only regulation of a nine inch size limit. In 1991, the first year I ran the OC Princess, a super-cruiser owned by the Nichols family; MD DNR Fisheries biologist, Nancy Butowski, told me: "All sea bass have spawned by nine inches, some twice." The Nichols allowed me to have boat regulations. Soon it was obviously true Ms. Butowski had been correct. Although pre-federal; with self-imposed management we saw an undeniable increase in sea bass populations. After a few years everyone in MD was using a 9 inch limit -- even commercial bass trappers because Martins Fish Company stopped buying super-smalls. A lot of those were culled dead, but not all of them. So, the Queen wreck went from a lone, isolated--but highly productive fish wise--shipwreck, to being the star of our most well-developed Maryland artificial reef site. On 5/25/1999 my clients caught 69 sea bass per-person. Of those 48 were thrown back as under size (we were probably insisting on 10.5 inches with a real 10 inch state/fed regulation) and 21 kept. On 5/26/1999 clients caught 32 per-person with 18 kept & 14 thrown back. On 5/17/2000 clients caught 35 per-person with 15 kept & 20 thrown back. I want readers to keep in mind that before 1992 we killed ALL our sea bass. I was taught - we all were - that throwing any fish back was useless because they all died. As a mate I made a fellow throw back a tiny sturgeon and damn near had a fist-fight. As a young captain I made a fellow throw back a 9 inch tog with same result. OC Princess sold in late 2002; on my boat, the Morning Star, we had a federal 12 inch limit in 2003 with 25 sea bass per-person allowed (second year of that regulation.) Often times clients would fish a 13 or 13.5 inch limit. On 5/13/03 we had 24 sea bass per-person with 36 thrown back by each angler too. On 5/28/03 we had 11 kept per-person & 55 throw backs each. Though not my favorite place to fish, the reef was hyper-productive. By the late 1990s it was also heavily pressured by 1/2 day boats. A long steam for them on a 4 hour trip -- but worth it. Now, today, having witnessed the squandering of this fishery by regulation that positively refuses self-examination, and 'science' which holds no possible affect to a reef's sea bass population from sub-bottom profilers (like ground penetrating radar,) yet that affect is real & damning -- today I cannot fish the Queen Reef & pass the redface test. I did stop there on a windy day for less than an hour this year (2017). We had a painfully slow pick & one keeper sea bass. Where once we had exciting all-day action, to go there today is a mistake. NOAA & NMFS: "Gee Golly Congress! We're doing a swell job of restoring sea bass!" 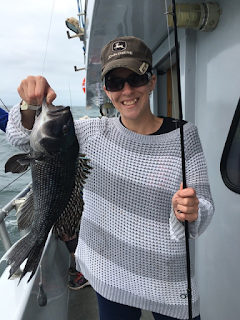 At sea, and in the checking accounts of many party/charter boats who specialize in sea bass, a different tale is being told. Especially in the nearshore area inside 12 miles & south of Montauk.. I've tried to convince management of habitat's importance for 3 decades, of corals growing on our hard substrates for two decades. Essential Fish Habitat has yet to be discovered between the beach & 100 fathoms in the Mid-Atlantic. We have no reefs -- officially. I've tried to convince management their use of recreational catch estimates "as is" was ruining any possibility of a good result in regulation. In 2016 MRIP, (NOAA's official rec catch estimate program) shows MD shore anglers landing 52,304 sea bass in Sept/Oct. This is far better than Party/Charter did. We caught about 4,000 pounds. But hey, at least they changed it from zero. I guarantee there were no 14 inch sea bass caught from shore. I've often written that the sciences of biology & ecology have nothing to do with Mid-Atlantic reef fish management; any reef fish from Maine to Texas actually. Regulation is driven by Catch -- the exact sort of catch as above; and as I've shown so many times to be beyond dumb ..yet it all gets crunched through the system as the "best available scientific information." We use "catch restriction" alone to restore marine species. Bad catch estimates & management's refusal to budge with catch data no one believes are the only reason for regulatory turmoil in the recreational fisheries. Detailed in Fish Report 6/5/17 as how survey noise can stymy a reef; here I'll try to show--try to simplify, the long slow death of a reef with heavy fishing pressure and a 12 or 12.5 inch size limit, and then the final insult of survey noise.. In those early days of management & pre-management when there was no regulation whatever, it really was true that ALL sea bass had spawned by 9 inches. Save in an area with greatest impact from the MD Wind Energy Area surveys, there are no under 9 inch spawners. To understand my assertions of how a recreational size limit can destroy spawning production it's necessary to understand this: sea bass (most of them) begin life as female. If needed for spawning they can quickly become male. How fast remains to be seen, but in aquaculture experiments once the male was removed from a tank the largest female began showing chemical changes in hours. It's not at all uncommon in reef fish. One assumes this developed because populations can be so widely separated on reefs many miles apart from each other. They can balance the spawning population themselves. When a female changes to male some form a 'nuchal hump.' This is the blue 'knothead' on a sea bass - an obvious sign indeed. Scientists scoff at my idea of retarded production because they routinely discover developed testes in smaller sea bass w/o a nuchal 'blue head' hump. I argue their theory is not being borne out owing the fact of our diminished production. To me it seems the knot headed males run the show like a bull keeping lesser males away in any herding species such as deer, sheep, or elk. They say "sneakers" mate, that small males with no obvious blue humphead are getting the job done.. I say "show me the production." While few scientists will give my idea of diminished production owing to increasing age at maturity the nod, my conclusions about bsb age at maturity & it's vital contribution to increased spawning production have only firmed in the near decade I've examined it. No, after careful examination & consideration, I've discarded all those in favor of this quirk in maturity. Where fishing pressure once assured abundance in 9, 10, & 11 inch size limits, now the 12+ inch size limit seals our fate. With just a few fish of 12 inches displaying a blue nuchal hump on every single piece of structure, the switch is turned off for 6, 7, 8, 9, 10, and even most 11 inch sea bass. Urge to spawn young -- Off. When a heavily pressured reef had dern few 12 inch fish & was dominated by thousands of age one, age two fish up to 11 inches -- it was 'all hands on deck' for spawning -- the biological trigger to spawn young was in effect. The reason it's had such a huge negative affect on nearshore populations is pressure: When sea bass matured young as all older literature claims, (even as small as 5.5 inches in the first months of life,) removal of quite nearly all the fish at a particular reef ensured smaller fish were the spawning population on those heavily pressured reefs--even in their first year of life. When management began we protected sea bass through their first spawn -- some for two spawning seasons. Later, with an 11 inch limit, we protected all of them for two years of spawning production. When the size limit hit 12 & then 12.5 inches -- all those younger fish failed to recruit to the spawning population. The urge to spawn young was turned off by the presence of large males. Up until 2001 it is my opinion that every marine-found bsb was a spawner. Every sea bass in the ocean was spawning. Now it's maybe 20% on less pressured reefs ...and almost none on heavily pressured reefs. It is absolutely possible to catch nearly every legal sea bass on a reef. Today we catch them just as they're maturing. Used to be we protected them fro a spawn or two. Once we crossed the 12 inch limit, what had worked so well in heavy pressure then became a liability. Because bsb mature today at age 3 & 4 (as opposed to age 0 & age 1 when there was a 9, 10, & 11 inch size limit,) just as they begin to spawn-----they also become legal. Also, I believe males especially 'fluff up' - that their colors grow brighter; & their fins/tails grow longer-faster prespawn than in normal growth -- they become legal faster. When a lot of folks are looking to fry you, that extra little bit of growth becomes fatal. With theory after theory cast aside & only one remaining -- I sincerely wish NMFS would discard the "We need to get lucky" method of fish production and now begin to seek ways to force increases in spawning production. More spawn, better water quality, better seafloor habitat -- it all matters. Yes, there will always be variances in spawning success, but this method of adding so vast a number of additional spawners is something I dearly wish we had understood at management's outset. I distinctly remember holding a large sea bass in November of (what probably was) 2003 and wondering, "where are the little guys?" In November/December all our sea bass move offshore. Now absent those tiniest sea bass, production was already lost. Or at least severely diminished. At that point I also 'knew,' as distinguished men of science also know today, that population in high density could/would result in retarded spawning production. Classic population biology.. However, as years wore on & the fact of lower production began to weigh more heavily on our fishery, it became obvious to me that "crowding" was NOT causing sea bass to put the brakes on come spawning season. Crowding is positively not the control for age at maturity. I believe instead it is simply the size of males around the reef. Reefs with far fewer fish than I'd ever seen were still maintaining an age 3+ male switching. Reefs with almost no sea bass at all still have no age 1 spawners. If this were a simple population density trigger, they'd have long-since reverted to age 1 spawning. 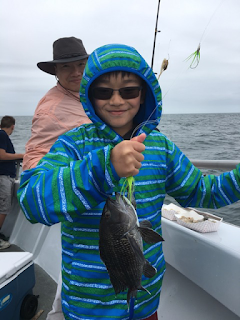 Only in the complete evacuation of sea bass from the 500 square miles or so of habitat affected by surveying the MD Wind Energy Area have we seen large percentages again of small (under 9 inches - age 1 males) again. Might it not be every bit as simple as any bull/harem spawning in a terrestrial sense? Were it crowding I'd have seen the effect sooner as reefs filled in our early efforts at regulation. We had unbelievably crowded reefs under self-regulation, yet maintained age 1 spawning inshore. In 2003 I thought we were at 'habitat capacity' and that the ONLY WAY we could further increase our sea bass population was by addition of more habitat. Were crowding causing delayed maturity as evidenced by males with a blue nuchal hump, (a 'knothead' sea bass,) the effect would have passed entirely by 2006 or 07 as populations diminished. Owing to the survey impact, we might see more small males in a day now than we were seeing in a year since 2001 or so.. I truly believe this needs to be understood. To increase the spawning population by 70% is an a amazingly powerful tool, and might be for many species. Here in mahi, and once upon a time in sea bass -- even if it was an accident. Mahi populations are believed to be stable and healthy due to their fast growth rate, high reproductive capacity, and reproductive maturity beginning at six months. If we found a way to delay mahi's spawning by several years, would we not also expect there to be an associated decline in population? BOFF is not always best. (Big Old Fecund Females ..fecund meaning lots of eggs) Sometimes youthful ebullience can account for a great deal of production. After about 15 years of diminished production owing size limit's affect on delaying maturity, we now add the multi-year affect of surveying---and WHATEVER top-secret business is being done on this large artificial reef we built with small private contributions across 3 decades: Today the Queen is dead. I've urged investigation for so long: Habitat--even of our temperate nearshore coral reefs, Age at Maturity, Surveying's Ability To Run Off Fish In A Huge Area, the Greening of Mid-Atlantic Ocean Waters, Red Hake/Scallop Production, Barotrauma's affect on sea bass populations, Trash in grand scale, Even an oil slick once. Now an almost completely dead reef - with the tightest regulations we've ever known. I anticipate a lot more nothing. Spend two million dollars to listen for whales in the all important wind energy area, and not a nickel to restore sea bass production - no desire I can see to even understand it. My kingdom that ocean governance might one day ponder what's real. Until then we'll continue to be victim to what could not be possible -- MRIP's assertions of recreational catch. Everytime they invent too much catch, we lose a more season. Truthfully; one bad MRIP catch estimate will be all it takes with sea bass. It's happening right now with tautog. Has already happened up north with short seasons, huge size limits, & tiny bag limits. Oceans people working for the government are retiring in fashion.